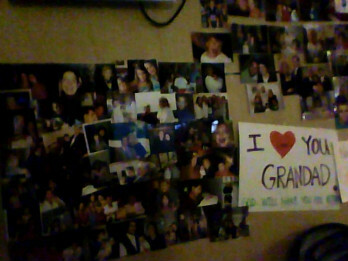 <<<----- This is what the wall looks like in my dad's ICU room. There are signs posted everywhere that say "No Flowers or Balloons" and so many rooms of patients are just a vast array of medical equipment, lines, beeps, noises and moreso, very lonely looking. We decorate with love and we have a pact that if any of us are in this situation we don't leave. That is right we don't leave. We cover in shifts and never leave the person in ICU alone. This wasn't something we decided to do when we were kids or anything to plan for this day, It is something we all discovered we wanted and needed to do when our dad was sick in 2004-2005 with his strokes. My mom and I cover the wee hours of the morning and the day and my brothers and sisters and their wives cover the night. My mom has a tendency, as I'm sure you can predict, to not want to ever leave his side. They've been married since Feb 14, 1975, have 10 kids and 16 grandkids. You can definitely feel the love. Yesterday when dad was somewhat alert, Hallie, my sister's daughter who is 12 (my niece) said "Grandad, I love you." He opened his eyes and squeezed her hand to know he heard her. One of the things the nurses constantly say is "They hear you and know you are there......."
There is an abundance in room 369. 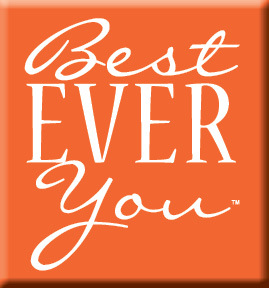 Elizabeth is the CEO and Founder of The Best Ever You Network. Love is Powerful. ps- I am the typo Queen, if you see one, just let me know. Our editors are off praying for my dad today. How beautiful - my family has experienced the pain of a loved one in intensive care. I am sure everything you do helps him, and also those that care for him. What a wonderful family.